Q: My idea: Dig a trench as long as you want and build an earthbag vault. About 2/3 would be below grade, depending on the water table. Add plastic and backfill on top and then add more plastic and more backfill, plus plants. What do you think? A: It turns out that earthbag vaults are not so easy to construct. The entryway to my house in Crestone is a vault, and it was one of the more difficult parts of the plan to accomplish. It only spans about 6 feet, and this is about the most that I would recommend anyone trying. Even Khalili doesn't use earthbags in his vaults...he switches to stabilized adobes. The problem is the same as trying to make very large arched doorways: it is too easy for the bags to deform and you lose the overall shape. Also, vaults put tremendous outward pressure on the walls they sit on, so they have to be quite thick (my entryway had 30" walls) or be buttressed. Of course this wouldn't be a problem in a dug-out pit arrangement like you describe. A carefully designed dome could be completely buried on the other hand. Domes are inherently much stronger in every way. Q: I know it is possible to build one dome, then add another at a later date. Is this done through vaults and arches? A: Yes, you have to prepare the place where you might want to join another dome or other structure in advance of actually doing it, i.e. as you are building the first wall. You basically create an arched doorway, and then just fill it back in with more earthbags, so that when you go in later to create the doorway, the opening just needs to be cleared of the infilled bags. Then a small connecting vault or passageway can be constructed. Q: I'm thinking of using earthbags to make a set of vaults, much like Nader Khalili has done at Cal-Earth. 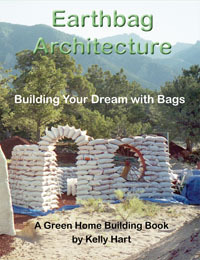 More particularly, I was attracted to the idea of using earthbags for the end walls and load-bearing walls, but instead of using pure earthbag construction to form the roof of the vaults, I'd use curved rebar to form the roof of the vault and overlay that with insulation and a clay-earth mixture. The reason I would like to do it this way instead of constructing the each vault wholly from earthbags has to do with the width of the vaults, which (as I'm planning them) is too wide to permit this (15' x 25' is my working number for each vault). A: I don't think that even Nader Khalili used earthbags exclusively for his larger vaults. There is just too much danger of collapse. I think he built up walls with earthbags to the spring line, and then did the vaults with stabilized adobe blocks. Q: The trouble I've gotten to is how best to build vaults and domes. I could use falsework to support the vault as it's being built, and then lower the falsework slowly, allowing the vault to shift to carry it's own weight. But that falsework must be pretty damn strong, and therefore not cheap. I don't want to have to add $10,000 for a reusable steel frame, if I don't have to. A: Earthbag domes are way easier to build than vaults, as they are generally self-supporting while being constructed. I did build an earthbag vaulted entrance to my house in Colorado. This was only about 8 feet wide at the base, tapering up to 6 feet where the vault began, and was two bags wide so that it required no further buttressing. I used a movable wooden form, about four feet long, and released this to go on to the next section. From this experience, I would venture to say that attempting an earthbag vault any wider than this would be very difficult, even as a catenary shape. As far as I know Nader Khalili never built any vaults with earthbags; he switched to adobe blocks or bricks or ferrocement for the vaulted portions of his designs. Q: How to corbel the roof in earthbag construction? What is the formula to keep the inclination from falling? Will it be possible to construct a Nubian vault over rectangular walls of earth bags? (Nubian vaults by adobe bricks / smaller earth bags). A: Earthbags can easily be corbeled in a dome as long as you don't exceed about a 60 degree angle (from the horizontal) as you go in. Anything over this is a bit risky, and may require formwork. Vaults with earthbags are much more difficult, and certainly require forms to accomplish. I made a vault spanning about 8 feet (2.5 m), and it required a very thick base to be stable. I have never seen an earthbag vault spanning more than this, without a permanent form under it. Q: I'm researching building a shop for my father out of rice hull bags. We live in an area that produces an abundance of rice, but we have hardly any rock or useful soil.I'd like to construct an extruded inverted catenary arch 20ft wide and 25ft long. This would place the top of the arch about 15' above the ground. I know that there hasn't been a lot of construction done with rice hull bags, but I'd love to try it out. Do you think it's possible, if I can support it during construction, that a rice bag structure of this size can support itself once complete? 1. Vaults are load-bearing, so all the weight is transferred down through the bag walls. The rice hulls would likely compress too much under the weight. 2. The rice hulls would be vulnerable to the elements. They will rot if they get wet. You'd need a foolproof roofing method. 3. Bags stacked in vaults will tend to kick out on the sides. They're unstable on large vaults. You need some way to hold them in position (bamboo, ferrocement, galvanized steel quonset huts. A: (Kelly) I agree with Owen that your proposed vault with bags of rice hulls has some inherent problems to overcome. I once conceived of a rigid framework made of welded rebar trusses, that could be shaped like a caqtenary arch, that would basically hold the structure rigid and the bags would be infill....but you still would have to come up with a waterproof membrane on the roof. The largest self-supporting earthbag vault that I know about is one that I made over a decade ago that spans only 8' and has massive 30" walls at the base. Q: Has anyone tried to use the Nubian Arch technique with earth bags or rice hull bags? A: Most Nubian arch building is done with solid adobe bricks that can immediately form a strong compressive structure, and it is usually done by laying the bricks nearly vertical using sticky mortar that will hold them in place as the arch is formed. You can't really do this with earthbags, as the relatively loose material needs to be compacted in place. Even Nadir Kahalili, who pioneered the use of earthbag building and built many vaulted structures, never used bags to form his vaults; he switched to ferrocement at the spring line of the vault. Q: I have already built a cordwood house and now I'd like to connect it to several outbuildings with a (4' wide inside) earthbag tunnel (vault) (all above ground - 6' high). I would like to make the tunnel itself travel in a series of arcs for stability and I can add buttresses to the outside. Are there any design considerations I should be aware of for tunnels? If the tunnel beginning and end were strongly supported and it was shaped to be an S-curve would there be any restrictions on how long the tunnel was? A: My experience has been that earthbag vaults are tricky to make...but possible. They require a form (which may be slid along as the vault proceeds). More significantly, they require either especially wide base walls (possibly two adjacent bag walls), or a great deal of buttressing to keep the vaulted ceiling from forcing the wall outward. As for the possible length of your vault, it doesn't really matter, as long as it is sufficiently buttressed. Q: I have seen so many brick arches that like that.Â Maybe because each brick is smaller?Â What if the earth bags were supported by something - heaven forbid, but the only thing I can think of at the moment is rebar? A: Yes, with some sort of structural framework, a larger vault with earthbags is probably possible. Bricks have the advantage of being much lighter in weight and being stuck together with mortar. Q: I am looking at some land that is about 60% hilly and would like to take advantage of the hills and build a mostly underground house in one of the hills. The front wall will be exposed to the surface but the rear wall, two sides and roof will all be under earth.Â I am hoping for 40' long and about 14' across.Â I was thinking that I could use earthbags to build the walls up to 4' and then use the vault type arch on top of that to give a final height of 11' tall (4'wall plus the height of the arch, 1/2 of 14').Â I am looking at 3-4 feet of soil on top of the roof. A: Earthbags do work well below ground, and should do fine for the bottom part of your vault. For the rest I would consider something like ferrocement. A: I am sure that you could use a section of a culvert in that way; they are designed to bury at a considerable distance from the surface. This would obviously limit your size to something fairly small. Another similar option to consider might be a section of a larger grain bin or even a much larger steel prefabricated quonset style building.